"Sans Italic" is noticably thinner than "Sans"
As of a recent update, It seems the "Sans" alias is a bit broken. It's supposed to map onto DejaVu Sans as far as I am aware, and while this is true for the "Regular" variant, the "Italic" variant seems to be using DejaVu Sans Condensed. You can check this yourself by installing "specimen" and opening the "Sans" typeface. Now compare it with "DejaVu Sans". I tried setting my desktop fonts all to DejaVu Sans to remove the ambiguity, but it seems that programs (in particular notification-daemon) are still using an italic form of Condensed rather than the Italic variant. So maybe this is a bug in DejaVu Sans. I also notice that there is no Condensed Italic, and Condensed Bold is in fact listed twice. Strange! Do you still have this problem? I have tried to reproduce it, but it seems like DejaVu Sans condensed is not in the font catalogue. And it also looks like Sans _is_ mapped onto DejaVu Sans. Still happening in Hardy at present. Sans Regular may be mapped to DejaVu Sans Roman, but Sans Italic is mapped to DejaVu Sans *Condensed* Oblique or something. By the way, DejaVu Sans "Condensed" is not a separate face, it is part of DejaVu Sans. Here's a test case for Gecko. DejaVu Sans is broken (as is Sans, by proxy). I am really confused as to what is going on with the DejaVu Sans typeface. 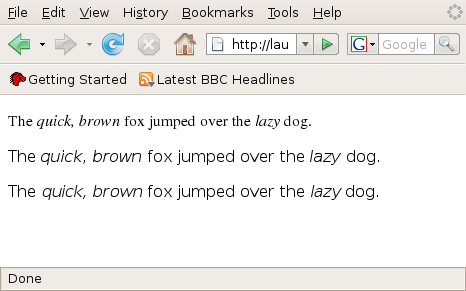 Sans has four "styles" listed in the GTK font selector: Regular, Italic, Bold, Bold Italic. Bitstream Vera has: Roman, Oblique, Bold, Bold Oblique. I have noticed, when browsing /usr/share/fonts/truetype/ttf-dejavu, that the DejaVuSansCondensed-Oblique.ttf font (whose name suggests it is the "Condensed Oblique" type, has metadata describing it as being the "Condensed Book" face. The actual font itself is definitely Condensed Oblique, so it just looks like a metadata error. Not sure if this is causing the problem, but it indicates that maybe the metadata needs checking over. ...and this one on Hardy is incorrect. DejaVuSansCondensed-Oblique.ttf: "DejaVu Sans" "Condensed Book"
I have opened a bug about the metadata issue here https://bugs.launchpad.net/ubuntu/+source/ttf-dejavu/+bug/187098 though I'm not sure if a resolution there leads to a resolution here. 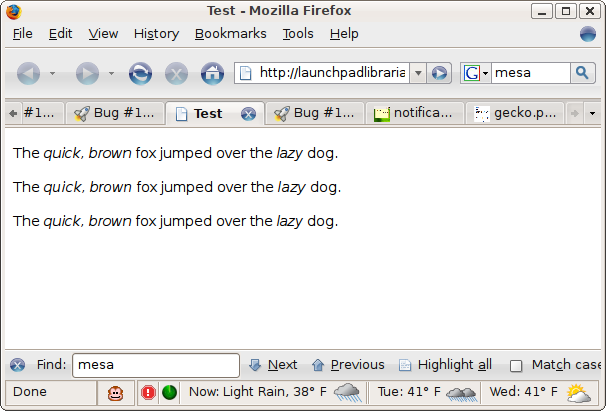 Yet firefox is still displaying the test case incorrectly, so it must be something else. In comparing the source files for ttf-dejavu on gutsy and hardy, it appears the issue is that the debian/ttf-dejavu-extra.defoma-hints file for Gutsy had a fix from Arne to correct Oblique vs Italic for Serif fonts, which is missing on Hardy. On hardy it appears the package was sync'd to debian without merging the ubuntu patch. Assigning to Arne to investigate further. It appears that the changes he made for Ubuntu in Gutsy need to be ported to the Hardy version of the package (and perhaps pushed back up to Debian). > DejaVu-Sans.ttf: "DejaVu Sans" "Book"
> DejaVuSans.ttf: "DejaVu Sans" "Book"
Hardy. I have marked it as resolved already.